You know the current vampire/horror boom is running out of legs when the genre starts getting the whole comedy exploitation thang. That being said, Dark Shadows looks like a hoot. A 19th century vampire (Barnabas Collins) and the witch that cursed him make it into the 1970s and re-start their ancient feud. It stars the ever-reliable Johnny Depp, who was a big fan of the original sixties comedy TV series of which this is of course, a re-boot. Extra points if you can tell me which of my Jackelian fantasy novels from HarperCollins featured a character called Barnabas (also a subtle tribute to Mr Collins)? This looks great. 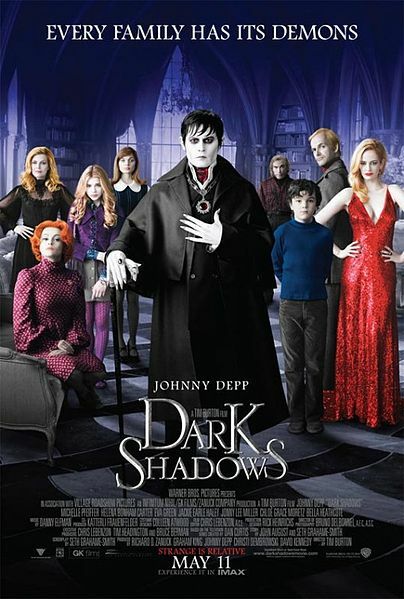 Johnny Depp even manages to look like Jonathon Fried, the man who played the original Barnabas in the sixties. I watched Dark Shadows when it originally aired. I have been a fan for years. But in all this time, I never realized it was a comedy. I thought it was mainly a drama. Oh, well, I guess, people see things differently. I like your blog.